Understanding planetary habitability is partly an extrapolation of the Earth's conditions, as it is the only planet currently known to support life. Planetary habitability is the measure of a planet's or a natural satellite's potential to develop and sustain life. As the existence of life beyond Earth is currently uncertain, planetary habitability is largely an extrapolation of conditions on Earth and the characteristics of the Sun and solar system which appear favorable to life's flourishing—in particular those factors that have sustained complex, multicellular organisms and not just simpler, unicellular creatures. Research and theory in this regard is a component of planetary science and the emerging discipline of astrobiology. An absolute requirement for life is an energy source, and the notion of planetary habitability implies that many other geophysical, geochemical, and astrophysical criteria must be met before an astronomical body can support life. In its astrobiology roadmap, NASA has defined the principal habitability criteria as "extended regions of liquid water, conditions favorable for the assembly of complex organic molecules, and energy sources to sustain metabolism." The late twentieth century saw two breakthroughs in the field. The observation and robotic spacecraft exploration of other planets and moons within the solar system has provided critical information on defining habitability criteria and allowed for substantial geophysical comparisons between the Earth and other bodies. The discovery of extrasolar planets, beginning in the early 1990s and accelerating thereafter, has provided further information for the study of possible extraterrestrial life. Most importantly, it confirmed that the Sun is not unique among stars in hosting planets and expanded habitability research horizon beyond our own solar system. An understanding of astrobiological potential begins with stars. While bodies that are generally Earth-like may be plentiful, it is just as important that their larger system be agreeable to life. Under the auspices of SETI's Project Phoenix, scientists Margaret Turnbull and Jill Tarter developed the "HabCat" (or Catalogue of Habitable Stellar Systems) in 2002. The catalogue was formed by winnowing the nearly 120,000 stars of the larger Hipparcos Catalogue into a core group of 17,000 "HabStars," and the selection criteria that were used provide a good starting point for understanding which astrophysical factors are necessary to habitable planets. They live at least a few billion years, allowing life a chance to evolve. More luminous main-sequence stars of the "O," "B," and "A" classes usually live less than a billion years and in exceptional cases less than 10 million. They emit enough high-frequency ultraviolet radiation to trigger important atmospheric dynamics such as ozone formation, but not so much that ionization destroys incipient life. Liquid water may exist on the surface of planets orbiting them at a distance that does not induce tidal lock (see next section and 3.2). This spectral range likely accounts for between 5 and 10% of stars in the local Milky Way galaxy. 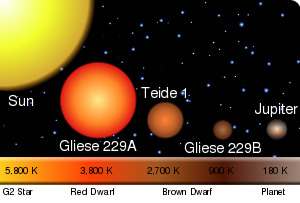 Whether fainter late K and M class red dwarf stars are also suitable hosts for habitable planets is perhaps the most important open question in the entire field of planetary habitability given their ubiquity; Gliese 581 c, a "super-earth," has been found orbiting in the habitable zone of a red dwarf and may possess liquid water. Alternately, a greenhouse effect may render it too hot to support life, while its next-nearest neighbor, Gliese 581 d, may in fact be a more likely candidate for habitability. The habitable zone (HZ) for any specific planet is a theoretical shell surrounding a star in which that planet would have liquid water on its surface. After an energy source, liquid water is considered the most important ingredient for life, considering how integral it is to all life systems on Earth. This may reflect the bias of a water-dependent species. If life is discovered in the absence of water (such as in a liquid ammonia solution), the notion of an HZ would need to be greatly expanded. A "stable" HZ denotes two factors. First, the range of an HZ should not vary greatly over time. All stars increase in luminosity as they age and a given HZ naturally migrates outwards, but if this happens too quickly (for example, with a super-massive star), planets may only have a brief window inside the HZ and a correspondingly weaker chance to develop life. Calculating an HZ range and its long-term movement is never straightforward, given that negative feedback loops such as the carbon cycle will tend to offset the increases in luminosity. Assumptions made about atmospheric conditions and geology thus have as great an impact on a putative HZ range as does Solar evolution; the proposed parameters of the Sun's HZ, for example, have fluctuated greatly. Secondly, no large-mass body such as a gas giant should be present in or relatively close to the HZ, thus disrupting the formation of Earth-like bodies. The mass of the asteroid belt, for example, appears to have been unable to accrete into a planet due to orbital resonances with Jupiter; if the giant had appeared in the region that is now between the orbits of Venus and Mars, Earth would almost certainly not have developed its present form. This is somewhat ameliorated by suggestions that a gas giant inside the HZ might have habitable moons under the right conditions. The Solar System follows an inner-terrestrial planet, outer-gas giant pattern, but discoveries of extrasolar planets suggest this may not be common to other stellar systems: numerous Jupiter-sized bodies have been found in close orbit about their primary, disrupting potential HZs. However, present data for extrasolar planets is likely to be skewed towards these types (large planets in close orbits) because they are far easier to identify; thus, it remains to be seen which type of stellar system is the norm, or indeed if there is one. Changes in luminosity are common to all stars, but the severity of such fluctuations covers a broad range. Most stars are relatively stable, but a significant minority of variable stars often experience sudden and intense increases in luminosity and consequently the amount of energy radiated toward bodies in orbit. These are considered poor candidates for hosting life-bearing planets as their unpredictability and energy output changes would negatively impact organisms. Most obviously, living things adapted to a particular temperature range would likely be unable to survive too great a temperature deviation. Further, upswings in luminosity are generally accompanied by massive doses of gamma ray and X-ray radiation which might prove lethal. Atmospheres do mitigate such effects (an absolute increase of 100 percent in the Sun's luminosity would not necessarily mean a 100 percent absolute temperature increase on Earth), but atmosphere retention might not occur on planets orbiting variables, because the high-frequency energy buffeting these bodies would continually strip them of their protective covering. The Sun, as in much else, is benign in terms of this danger: the variation between solar max and minimum is roughly 0.1 percent over its 11-year solar cycle. There is strong (though not undisputed) evidence that even minor changes in the Sun's luminosity have had significant effects on the Earth's climate well within the historical era; the Little Ice Age of the mid-second millennium, for instance, may have been caused by a relatively long-term decline in the sun's luminosity. Thus, a star does not have to be a true variable for differences in luminosity to affect habitability. Of known "solar analogs," the one that most closely resembles the Sun is considered to be 18 Scorpii; unfortunately for the prospects of life existing in its proximity, the only significant difference between the two bodies is the amplitude of the solar cycle, which appears to be much greater for 18 Scorpii. While the bulk of material in any star is hydrogen and helium, there is a great variation in the amount of heavier elements (metals) stars contain. A high proportion of metals in a star correlates to the amount of heavy material initially available in protoplanetary disks. A low amount of metal significantly decreases the probability that planets will have formed around that star, under the solar nebula theory of planetary systems formation. Any planets that did form around a metal-poor star would likely be low in mass, and thus unfavorable for life. Spectroscopic studies of systems where exoplanets have been found to date confirm the relationship between high metal content and planet formation: "stars with planets, or at least with planets similar to the ones we are finding today, are clearly more metal rich than stars without planetary companions." High metallicity also places a requirement for youth on hab-stars: stars formed early in the universe's history have low metal content and a correspondingly lesser likelihood of having planetary companions. The chief assumption about habitable planets is that they are terrestrial. Such planets, roughly within one order of magnitude of Earth mass, are primarily composed of silicate rocks and have not accreted the gaseous outer layers of hydrogen and helium found on gas giants. Some scientists have suggested that life might evolve in the cloud tops of giant planets. However, this possibility is considered unlikely, given that those planets have no surface and their gravity is enormous. The natural satellites of giant planets, meanwhile, are still considered candidates for hosting life. In analyzing which environments are likely to support life, a distinction is usually made between simple, unicellular organisms such as bacteria and archaea and complex metazoans (animals). Unicellularity necessarily precedes multicellularity in any hypothetical tree of life and where single-celled organisms do emerge there is no assurance that this will lead to greater complexity. The planetary characteristics listed below are considered crucial for life in general, but in every case habitability impediments should be considered greater for multicellular organisms such as plants and animals versus unicellular life. 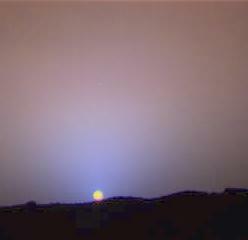 Mars, with its thin atmosphere, is colder than Earth would be at a similar distance from the Sun. Low-mass planets are poor candidates for life for two reasons. First, their lesser gravity makes atmosphere retention difficult, although global magnetic fields can play a large role in atmospheric retention. Constituent molecules are more likely to reach escape velocity and be lost to space when buffeted by solar wind or stirred by collision. Planets without a thick atmosphere lack the matter necessary for primal biochemistry, have little insulation and poor heat transfer across their surfaces (for example, Mars with its thin atmosphere is colder than the Earth would be if it were at a similar distance) and lesser protection against high-frequency radiation and meteoroids. Further, where an atmosphere is less than 0.006 Earth atmospheres water cannot exist in liquid form as the required atmospheric pressure, 4.56 mmHg (608 Pa) (0.18 inHg), does not occur . The temperature range at which water is liquid is smaller at low pressures generally. Secondly, smaller planets have smaller diameters and thus higher surface-to-volume ratios than their larger cousins. Such bodies tend to lose the energy left over from their formation quickly and end up geologically dead, lacking the volcanoes, earthquakes and tectonic activity which supply the surface with life-sustaining material and the atmosphere with temperature moderators like carbon dioxide. The existence of tidal forces from nearby objects such as natural moons can convert rotational energy into vast amounts of internal heating which can be seen to play an important alternate internal heating role in moons in our own solar system such as Io. Plate tectonics appear particularly crucial, at least on Earth: not only does the process recycle important chemicals and minerals, it also fosters bio-diversity through continent creation and increased environmental complexity and helps create the convective cells necessary to generate Earth's magnetic field. The label "low mass" is a relative term. The Earth is considered low mass when compared to the Solar System's gas giants, but it is the largest (by diameter and mass) and densest of all terrestrial bodies. It is large enough to retain an atmosphere through gravity alone and large enough that its molten core remains a heat engine, driving the diverse geology of the surface. (The decay of radioactive elements within a planet's core is the other significant component of planetary heating.) Mars, by contrast, is nearly (or perhaps totally) geologically dead and has lost much of its atmosphere. Thus, it would be fair to infer that the lower mass limit for habitability lies somewhere between Mars and Earth-Venus; 0.3 Earth masses has been offered as a rough dividing line for habitable planets. However, a 2008 study by the Harvard-Smithsonian Center for Astrophysics suggests that the dividing line may be higher still. Earth may in fact lie on the lower boundary of habitability, since if it were any smaller, plate tectonics would be impossible. Venus, which has 85 percent Earth's mass, shows no signs of tectonic activity. Conversely, "super-Earths," terrestrial planets with higher masses than Earth, would have higher levels of plate tectonics and thus be firmly placed in the habitable range. Exceptional circumstances do offer exceptional cases: Jupiter's moon Io (smaller than the terrestrial planets) is volcanically dynamic because of the gravitational stresses induced by its orbit. Neighboring Europa may have a liquid ocean underneath a frozen shell due also to power generated through its orbiting a gas giant. Saturn's Titan, meanwhile, has an outside chance of harboring life, as it has retained a thick atmosphere and biochemical reactions are possible in liquid methane on its surface. These satellites are exceptions, but they suggest that mass as a habitability criterion cannot be considered definitive. Finally, a larger planet is likely to have a large iron core. This allows for a magnetic field to protect the planet from its stellar wind, which otherwise would tend to strip away the planetary atmosphere and to bombard living things with ionized particles. Mass is not the only criterion for producing a magnetic field—as the planet must also rotate fast enough to produce a dynamo effect within its core, but it is a significant component of the process. As with other criteria, stability is the critical consideration in determining the effect of orbital and rotational characteristics on planetary habitability. Orbital eccentricity is the difference between a planet's closest and farthest approach to its primary. The greater the eccentricity the greater the temperature fluctuation on a planet's surface. Although they are adaptive, living organisms can only stand so much variation, particularly if the fluctuations overlap both the freezing point and boiling point of the planet's main biotic solvent (e.g., water on Earth). If, for example, Earth's oceans were alternately boiling and freezing solid, it is difficult to imagine life as we know it having evolved. The more complex the organism, the greater the temperature sensitivity. The Earth's orbit is almost wholly circular, with an eccentricity of less than 0.02; other planets in our solar system (with the exception of Mercury) have eccentricities that are similarly benign. Data collected on the orbital eccentricities of extrasolar planets has surprised most researchers: 90 percent have an orbital eccentricity greater than that found within the solar system, and the average is fully 0.25. This is a potential barrier to habitability, but it is unclear exactly how much orbital eccentricity would cause a critical problem. A planet's movement around its rotational axis must also meet certain criteria if life is to have the opportunity to evolve. A first assumption is that the planet should have moderate seasons. If there is little or no axial tilt (or obliquity) relative to the perpendicular of the ecliptic, seasons will not occur and a main stimulant to biospheric dynamism will disappear. The planet would also be colder than it would be with a significant tilt: when the greatest intensity of radiation is always within a few degrees of the equator, warm weather cannot move poleward and a planet's climate becomes dominated by colder polar weather systems. If a planet is radically tilted, meanwhile, seasons will be extreme and make it more difficult for a biosphere to achieve homeostasis. Although during the Quaternary higher axial tilt of the Earth coincides with reduced polar ice, warmer temperatures and less seasonal variation, scientists do not know whether this trend would continue indefinitely with further increases in axial tilt (see Snowball Earth). The exact effects of these changes can only be computer modeled at present, and studies have shown that even extreme tilts of up to 85 degrees do not absolutely preclude life "provided it does not occupy continental surfaces plagued seasonally by the highest temperature." Not only the mean axial tilt, but also its variation over time must be considered. The Earth's tilt varies between 21.5 and 24.5 degrees over 41,000 years. A more drastic variation, or a much shorter periodicity, would induce climatic effects such as variations in seasonal severity. The planet should rotate relatively quickly so that the day-night cycle is not overlong. If a day takes years, the temperature differential between the day and night side will be pronounced, and problems similar to those noted with extreme orbital eccentricity will come to the fore. Change in the direction of the axis rotation (precession) should not be pronounced. In itself, precession need not affect habitability as it changes the direction of the tilt, not its degree. However, precession tends to accentuate variations caused by other orbital deviations; see Milankovitch cycles. Precession on Earth occurs over a 26 000 year cycle. The Earth's Moon appears to play a crucial role in moderating the Earth's climate by stabilizing the axial tilt. It has been suggested that a chaotic tilt may be a "deal-breaker" in terms of habitability — in other words, a satellite the size of the Moon is not only helpful but necessary to produce stability. This view, however, remains controversial. It is generally assumed that any extraterrestrial life that might exist will be based on the same fundamental chemistry as found on Earth, as the four elements most vital for life, carbon, hydrogen, oxygen, and nitrogen, are also the most common chemically reactive elements in the universe. Indeed, simple biogenic compounds, such as amino acids, have been found in meteorites and in interstellar space. These four elements together comprise over 96% of Earth's collective biomass. Carbon has an unparalleled ability to bond with itself and to form a massive array of intricate and varied structures, making it an ideal material for the complex mechanisms that form living cells. Hydrogen and oxygen, in the form of water, compose the solvent in which biological processes take place and in which the first reactions occurred that led to life's emergence. The energy released in the formation of powerful covalent bonds between carbon and oxygen, available by oxidizing organic compounds, is the fuel of all complex life-forms. These four elements together make up amino acids, which in turn are the building blocks of proteins, the substance of living tissue. In addition, neither sulfur, required for the building of proteins, nor phosphorus, needed for the formation of DNA and RNA and the adenosine phosphates essential to metabolism, are rare. Relative abundance in space does not always mirror differentiated abundance within planets; of the four life elements, for instance, only oxygen is present in any abundance in the Earth's crust. This can be partly explained by the fact that many of these elements, such as hydrogen and nitrogen, along with their simplest and most common compounds, such as carbon dioxide, carbon monoxide, methane, ammonia, and water, are gaseous at warm temperatures. In the hot region close to the Sun, these volatile compounds could not have played a significant role in the planets' geological formation. Instead, they were trapped as gases underneath the newly formed crusts, which were largely made of rocky, involatile compounds such as silica (a compound of silicon and oxygen, accounting for oxygen's relative abundance). Outgassing of volatile compounds through the first volcanoes would have contributed to the formation of the planets' atmospheres. The Miller experiments showed that, with the application of energy, amino acids can form from the synthesis of the simple compounds within a primordial atmosphere. Even so, volcanic outgassing could not have accounted for the amount of water in Earth's oceans. The vast majority of the water, and arguably of the carbon, necessary for life must have come from the outer solar system, away from the Sun's heat, where it could remain solid. Comets impacting with the Earth in the Solar system's early years would have deposited vast amounts of water, along with the other volatile compounds life requires (including amino acids) onto the early Earth, providing a kick-start to the evolution of life. Thus, while there is reason to suspect that the four "life elements" ought to be readily available elsewhere, a habitable system likely also requires a supply of long-term orbiting bodies to seed inner planets. Without comets there is a possibility that life as we know it would not exist on Earth. In determining the feasibility of extraterrestrial life, astronomers had long focused their attention on stars like our own Sun. However, they have begun to explore the possibility that life might form in systems very unlike our own. Typical estimates often suggest that 50 percent or more of all stellar systems are binary systems. This may be partly sample bias, as massive and bright stars tend to be in binaries and these are most easily observed and catalogued; a more precise analysis has suggested that more common, fainter, stars are usually singular and that up to two thirds of all stellar systems are therefore solitary. The separation between stars in a binary may range from less than one astronomical unit (AU, the Earth-Sun distance) to several hundred. In latter instances, the gravitational effects will be negligible on a planet orbiting an otherwise suitable star and habitability potential will not be disrupted unless the orbit is highly eccentric (see Nemesis, for example). However, where the separation is significantly less, a stable orbit may be impossible. If a planet’s distance to its primary exceeds about one fifth of the closest approach of the other star, orbital stability is not guaranteed. Whether planets might form in binaries at all had long been unclear, given that gravitational forces might interfere with planet formation. Theoretical work by Alan Boss at the Carnegie Institution has shown that gas giants can form around stars in binary systems much as they do around solitary stars. One study of Alpha Centauri, the nearest star system to the Sun, suggested that binaries need not be discounted in the search for habitable planets. Centauri A and B have an 11 AU distance at closest approach (23 AU mean), and both should have stable habitable zones. A study of long-term orbital stability for simulated planets within the system shows that planets within approximately three AU of either star may remain stable (i.e. the semi-major axis deviating by less than 5%). The HZ for Centauri A is conservatively estimated at 1.2 to 1.3 AU and Centauri B at 0.73 to 0.74—well within the stable region in both cases. Relative star sizes and photospheric temperatures. Any planet around a red dwarf such as the one shown here would have to huddle close to achieve Earth-like temperatures, likely inducing tidal lock. See Aurelia. Determining the habitability of red dwarf stars could help determine how common life in the universe might be, as red dwarfs make up between 70 to 90 percent of all the stars in the galaxy. Brown dwarfs are likely more numerous than red dwarfs. However, they are not generally classified as stars, and could never support life as we understand it, since what little heat they emit quickly disappears. Astronomers for many years ruled out red dwarfs as potential abodes for life. Their small size (from 0.1 to 0.6 solar masses) means that their nuclear reactions proceed exceptionally slowly, and they emit very little light (from 3 percent of that produced by the Sun to as little as 0.01 percent). Any planet in orbit around a red dwarf would have to huddle very close to its parent star to attain Earth-like surface temperatures; from 0.3 AU (just inside the orbit of Mercury) for a star like Lacaille 8760, to as little as 0.032 AU for a star like Proxima Centauri (such a world would have a year lasting just 6.3 days). At those distances, the star's gravity would cause tidal lock. The daylight side of the planet would eternally face the star, while the night-time side would always face away from it. The only way potential life could avoid either an inferno or a deep freeze would be if the planet had an atmosphere thick enough to transfer the star's heat from the day side to the night side. It was long assumed that such a thick atmosphere would prevent sunlight from reaching the surface in the first place, preventing photosynthesis. This pessimism has been tempered by research. Studies by Robert Haberle and Manoj Joshi of NASA's Ames Research Center in California have shown that a planet's atmosphere (assuming it included greenhouse gases CO2 and H2O) need only be 100 mbs, or 10 percent of Earth's atmosphere, for the star's heat to be effectively carried to the night side. This is well within the levels required for photosynthesis, though water would still remain frozen on the dark side in some of their models. Martin Heath of Greenwich Community College, has shown that seawater, too, could be effectively circulated without freezing solid if the ocean basins were deep enough to allow free flow beneath the night side's ice cap. Further research—including a consideration of the amount photosynthetically active radiation—suggested that tidally locked planets in red dwarf systems might at least be habitable for higher plants. Size is not the only factor in making red dwarfs potentially unsuitable for life, however. On a red dwarf planet, photosynthesis on the night side would be impossible, since it would never see the sun. On the day side, because the sun does not rise or set, areas in the shadows of mountains would remain so forever. Photosynthesis as we understand it would be complicated by the fact that a red dwarf produces most of its radiation in the infrared, and on the Earth the process depends on visible light. There are potential positives to this scenario. Numerous terrestrial ecosystems rely on chemosynthesis rather than photosynthesis, for instance, which would be possible in a red dwarf system. A static primary star position removes the need for plants to steer leaves toward the sun, deal with changing shade/sun patterns, or change from photosynthesis to stored energy during night. Because of the lack of a day-night cycle, including the weak light of morning and evening, far more energy would be available at a given radiation level. Red dwarfs are far more variable and violent than their more stable, larger cousins. Often they are covered in starspots that can dim their emitted light by up to 40 percent for months at a time, while at other times they emit gigantic flares that can double their brightness in a matter of minutes. Such variation would be very damaging for life, as it would not only destroy any complex organic molecules that could possibly form biological precursors, but also because it would blow off sizeable portions of the planet's atmosphere. For a planet around a red dwarf star to support life, it would require a rapidly rotating magnetic field to protect it from the flares. However, a tidally locked planet rotates only very slowly, and so cannot produce a geodynamo at its core. However, the violent flaring period of a red dwarf's lifecycle is estimated to only last roughly the first 1.2 billion years of its existence. If a planet forms far away from a red dwarf so as to avoid tidelock, and then migrates into the star's habitable zone after this turbulent initial period, it is possible that life may have a chance to develop. There is, however, one major advantage that red dwarfs have over other stars as abodes for life: they live a long time. It took 4.5 billion years before humanity appeared on Earth, and life as we know it will see suitable conditions for at most 1 billion years more. Red dwarfs, by contrast, could live for trillions of years, because their nuclear reactions are far slower than those of larger stars, meaning that life both would have longer to evolve and longer to survive. Further, while the odds of finding a planet in the habitable zone around any specific red dwarf are slim, the total amount of habitable zone around all red dwarfs combined is equal to the total amount around sun-like stars given their ubiquity. While most investigations of extraterrestrial life start with the assumption that advanced life-forms must have similar requirements for life as on Earth, the hypothesis of alternative biochemistry suggests possibility of life-forms evolving around a metabolism mechanism different from what is known on Earth. There is a possibility that other elements beyond those necessary on Earth will provide a biochemical basis for life elsewhere. The idea of biochemical cycles that are not carbon-based nor involving water has been explored mostly in fiction. As discussed in Evolving the Alien, biologist Jack Cohen and mathematician Ian Stewart argue that astrobiology, based on the Rare Earth hypothesis, is restrictive and unimaginative. They argue that Earth-like planets may be very rare, but non carbon-based complex life could possibly emerge in other environments. "Good Jupiters" are gas giant planets, like the solar system's Jupiter, that orbit their stars in circular orbits far enough away from the HZ to not disturb it but close enough to "protect" terrestrial planets in closer orbit in two critical ways. First, they help to stabilize the orbits, and thereby the climates, of the inner planets. Second, they keep the inner solar system relatively free of comets and asteroids that could cause devastating impacts. Jupiter orbits the sun at about five times the distance between the Earth and the Sun. This is the rough distance we should expect to find good Jupiters elsewhere. Jupiter's "caretaker" role was dramatically illustrated in 1994 when Comet Shoemaker-Levy 9 impacted the giant; had Jovian gravity not captured the comet, it may well have entered the inner solar system. Early in the Solar System's history, Jupiter played a somewhat contrary role: it increased the eccentricity of asteroid belt orbits and enabled many to cross Earth's orbit and supply the planet with important volatiles. Before Earth reached half its present mass, icy bodies from the Jupiter–Saturn region and small bodies from the primordial asteroid belt supplied water to the Earth due to the gravitational scattering of Jupiter and, to a lesser extent, Saturn. Thus, while the gas giants are now helpful protectors, they were once suppliers of critical habitability material. In contrast, Jupiter-sized bodies that orbit too close to the habitable zone but not in it (as in 47 Ursae Majoris), or have a highly elliptical orbit that crosses the habitable zone (like 16 Cygni B) make it very difficult for an Earthlike planet to exist in the system. See discussion of a stable habitable zone above. It is not in a globular cluster where immense star densities are inimical to life, given excessive radiation and gravitational disturbance. Globular clusters are also primarily composed of older, likely metal-poor, stars. The circular orbit of the Sun around the galactic centre keeps it out of the way of the galaxy's spiral arms where once more intense radiation and gravitation may lead to disruption. Thus, relative loneliness is ultimately what a life-bearing system needs. If the Sun were crowded amongst other systems the chance of being fatally close to dangerous radiation sources would increase significantly. Further, close neighbors might disrupt the stability of various orbiting bodies such as Oort cloud and Kuiper Belt objects, which can bring catastrophe if knocked into the inner solar system. While stellar crowding proves disadvantageous to habitability so too does extreme isolation. A star as metal-rich as the Sun would likely not have formed in the very outermost regions of the Milky Way given a decline in the relative abundance of metals and a general lack of star formation. Thus, a "suburban" location, such as our Solar System enjoys, is preferable to a Galaxy's center or farthest reaches. A supplement to the factors that support life's emergence is the notion that life itself, once formed, becomes a habitability factor in its own right. An important Earth example was the production of oxygen by ancient cyanobacteria, and eventually photosynthesizing plants, leading to a radical change in the composition of Earth’s atmosphere. This oxygen would prove fundamental to the respiration of later animal species. This interaction between life and subsequent habitability has been explored in various ways. The Gaia hypothesis, a class of scientific models of the geo-biosphere pioneered by Sir James Lovelock in 1975, argues that life as a whole fosters and maintains suitable conditions for itself by helping to create a planetary environment suitable for its continuity; at its most dramatic, Gaia suggests that planetary systems behave similar to a kind of organism. The most successful life forms change the composition of the air, water, and soil in ways that make their continued existence more certain—a controversial extension of the accepted laws of ecology. Similarly, David Grinspoon has suggested a "Living Worlds hypothesis" in which our understanding of what constitutes habitability cannot be separated from life already extant on a planet. Planets that are geologically and meteorologically alive are much more likely to be biologically alive as well and "a planet and its life will co-evolve." In their 2004 book The Privileged Planet, astronomer Guillermo Gonzalez and philosopher Jay Richards explore the possible link between the habitability of a planet and its suitability for observing the rest of the universe. The book was criticized as an example of intelligent design and for its lack of scientific credibility. 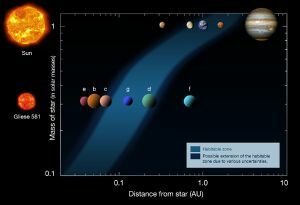 Another complicating factor in the search of planetary habitability criteria is that only a tiny portion of a planet needs to be habitable to support some life. Astrobiologists often concern themselves with "microenvironments" noting that "we lack a fundamental understanding of how evolutionary forces, such as mutation, selection, and genetic drift, operate in microorganisms that act on and respond to changing microenvironments." For example, a planet that might otherwise be unable to support an atmosphere given the solar conditions in its vicinity, might be able to do so within a deep shadowed rift or volcanic cave. Carl Sagan explored examples of this concept in the solar system itself, considering the possibility of organisms that are always airborne within the high atmosphere of Jupiter in a 1976 paper, despite the fact that Jupiter's surface itself is obviously uninhabitable. ↑ Goal 1: Understand the nature and distribution of habitable environments in the Universe. NASA. Retrieved January 12, 2009. ↑ A. Wolszczan, D.A. Frail. 1992. A planetary system around the millisecond pulsar PSR1257 + 12. Nature 355:145–147. Retrieved January 12, 2009. ↑ A. Wolszczan, 1994. Confirmation of Earth Mass Planets Orbiting the Millisecond Pulsar PSR:B1257+12. Science 264(5158):538. Retrieved January 12, 2009. ↑ Turnbull, Margaret C., and Jill C. Tarter. 2003. Target selection for SETI: A catalog of nearby habitable stellar systems. The Astrophysical Journal Supplement Series. 145:181–198. - Habitability criteria defined—the foundational source for this article. ↑ According to current scientific thinking, life may have emerged on Earth approximately 500 million years after the planet’s formation. "A" class stars (which shine for between 600 million and 1.2 billion years) and a small fraction of "B" class stars (which shine 10+ million to 600 million years) fall within this window. At least theoretically, life could emerge in such systems, but it would almost certainly not reach a sophisticated level given these time frames, and because increases in luminosity would occur quite rapidly. Life around "O" class stars is exceptionally unlikely, as they shine for less than ten million years. ↑ James F. Kasting, D.C. Whittet, and W.R. Sheldon. 1997. Ultraviolet radiation from F and K stars and implications for planetary habitability. Origins of Life and Evolution of Biospheres 27(4):413–420. Retrieved January 12, 2009. ↑ Gliese 581: one planet might indeed be habitable. Astronomy & Astrophysics. Retrieved January 12, 2009. ↑ Life as We Don't Know it: The Dialectic Game. astrobio.net. Retrieved January 12, 2009. ↑ Europa and Titan (respectively, 3.5 and 8 astronomical units outside our Sun’s putative habitable zone) are considered prime extraterrestrial possibilities. This view suggests that scientists are willing to look beyond the HZ criterion. ↑ James F. Kasting, Daniel P. Whitmore, and Ray T. Reynolds. 1993. Habitable Zones Around Main Sequence Stars. Icarus 101:108–128. Retrieved January 12, 2009. ↑ Darren M. Williams, James F. Kasting, and Richard A. Wade. 1997. Habitable moons around extrasolar giant planets. Nature 385:234–236. Retrieved January 12, 2009. ↑ The Little Ice Age. Department of Atmospheric Science.] University of Washington. Retrieved January 12, 2009. ↑ 18 Scorpii. Sol Company. Retrieved January 12, 2009. ↑ Nuno C. Santos, Garik Israelian, and Michael Mayor. 2003. Confirming the Metal-Rich Nature of Stars with Giant Planets, Proceedings of 12th Cambridge Workshop on Cool Stars, Stellar Systems, and The Sun. University of Colorado. Retrieved January 12, 2009. ↑ 15.0 15.1 An interview with Dr. Darren Williams. Astrobiology: The Living Universe. Retrieved January 12, 2009. ↑ C. Sagan, and E.E. Salpeter. 1976. Particles, environments, and possible ecologies in the Jovian atmosphere. The Astrophysical Journal Supplement Series 32:633–637. ↑ In Evolving the Alien, Jack Cohen and Ian Stewart evaluate plausible scenarios in which life might form in the cloud tops of Jovian planets. ↑ Could there be life in the outer solar system? Millennium Mathematics Project, Videoconferences for Schools. University of Cambridge. Retrieved January 12, 2009. ↑ There is an emerging consensus that single-celled microorganisms may be common in the universe, based on the knowledge that Earth’s extremophiles flourish in environments that were once considered hostile to life. However, the potential occurrence of complex, multicellular life remains much more controversial. In their work Rare Earth: Why Complex Life Is Uncommon in the Universe, Peter Ward and Donald Brownlee argue that microbial life is likely widespread while complex life is very rare and perhaps unique to Earth. Current knowledge of Earth’s history supports this theory: multicellular organisms are believed to have emerged at the time of the Cambrian explosion close to 600 mya but more than 3 billion years after unicellular life appeared. That life on Earth remained unicellular for so long underscores the view that the decisive step toward complex organisms need not necessarily occur. ↑ Ward, Brownlee. 2000. pages 191–220. ↑ In the Solar System, there is a "mass-gap" between Earth and the two smallest gas giants, Uranus and Neptune, which are 13 and 17 Earth-masses. There is, however, no known geophysical barrier to the formation of intermediate-size bodies, and one should expect to find planets throughout the galaxy between two and twelve Earth-masses. If the star system is otherwise favorable, such planets would be good candidates for life as they would be large enough to remain internally dynamic and retain an atmosphere over billions of years but not so large as to accrete the gaseous shell that limits the possibility of life formation. ↑ The Heat History of the Earth. James Madison University. Retrieved January 12, 2009. ↑ Sean N. Raymond, Thomas Quinn, and Jonathan I. Lunine. 2007. High-resolution simulations of the final assembly of Earth-like planets 2: water delivery and planetary habitability. Astrobiology. 7(Preprint):66. Retrieved January 12, 2009. ↑ Earth: A Borderline Planet for Life? Harvard-Smithsonian Center for Astrophysics. Retrieved January 12, 2009. ↑ Magnetic Field of the Earth. Georgia State University. Retrieved January 12, 2009. ↑ Ward, and Brownlee, 2000, 122–123. ↑ Henry Bortman, 2005. Elusive Earths. Astrobiology Magazine. Retrieved January 12, 2009. ↑ Planetary Tilt Not A Spoiler For Habitation. Penn State University. Retrieved January 12, 2009. ↑ J. Lasker, F. Joutel, and P. Robutel. 1993. Stabilization of the earth's obliquity by the moon. Nature 361(6413):615–617. Retrieved January 12, 2009. ↑ According to prevailing theory (the giant impact hypothesis), a Mars-sized body struck the Earth in a glancing collision late in the Earth's formation, and the ejected material coalesced and fell into orbit, leading to formation of the Moon. In Rare Earth, Peter Ward and Donald Brownlee emphasize that such impacts ought to be rare, reducing the probability of other Earth-Moon type systems, and hence the probability of other habitable planets. However, other moon formation processes are possible. Also, the proposition that a planet may be habitable in the absence of a moon has not been disproven. ↑ Organic Molecule, Amino Acid-Like, Found In Constellation Sagittarius. Science Daily. Retrieved January 12, 2009. ↑ David Darling, Elements, biological abundance. The Encyclopedia of Astrobiology, Astronomy, and Spaceflight. Retrieved January 12, 2009. ↑ How did chemistry and oceans produce this? University of Oregon. Retrieved January 12, 2009. 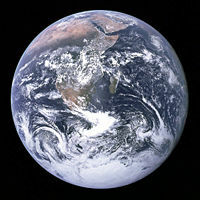 ↑ How did the Earth Get to Look Like This? University of Oregon. Retrieved January 12, 2009. ↑ Most Milky Way Stars Are Single. Harvard-Smithsonian Center for Astrophysics. Retrieved January 12, 2009. ↑ Stars and Habitable Planets. Sol Company. Retrieved January 12, 2009. ↑ Planetary Systems can from around Binary Stars. Carnegie Institution. Retrieved January 12, 2009. ↑ Paul A. Wiegert, and Matt J. Holman. 1997. The stability of planets in the Alpha Centauri system. The Astronomical Journal 113(4):1445–1450. Retrieved January 12, 2009. ↑ M.M. Joshi, R.M. Haberle, and R.T. Reynolds. 1997. Simulations of the Atmospheres of Synchronously Rotating Terrestrial Planets Orbiting M Dwarfs: Conditions for Atmospheric Collapse and the Implications for Habitability. Icarus 129(2):450–465. Retrieved January 12, 2009. ↑ Martin J. Heath, Laurance R. Doyle, Manoj M. Joshi, and Robert M. Haberle. 1999. Habitability of Planets Around Red Dwarf Stars. Origins of Life and Evolution of the Biosphere. 29(4):405–424. Retrieved January 12, 2009. ↑ Ken Croswell, 2001. Red, willing and able. New Scientist. Retrieved January 12, 2009. ↑ 'The end of the world' has already begun, UW scientists say. University of Washington. Retrieved January 12, 2009. ↑ M Dwarfs: The Search for Life is On, Interview with Todd Henry. Astrobiology Magazine. Retrieved January 12, 2009. ↑ Henry Bortman, 2004. Coming Soon: "Good" Jupiters. Astrobiology Magazine. Retrieved January 12, 2009. ↑ Jonathan I. Lunine, 2001. The occurrence of Jovian planets and the habitability of planetary systems. Proceedings of the National Academy of Sciences. 98(3):809–814. Retrieved January 12, 2009. ↑ Leslie Mullen, 2001. Galactic Habitable Zones. Astrobiology Magazine. Retrieved January 12, 2009. ↑ Ward and Brownlee, 2000, 26–29. ↑ Bruce Dorminey, 2005. Dark Threat. Astronomy Magazine. 40–45. ↑ The Living Worlds Hypothesis. Astrobiology Magazine. Retrieved January 12, 2009. ↑ William H. Jafferys, Review of The Privileged Planet. National Center for Science Education. Retrieved January 12, 2009. ↑ Understand the evolutionary mechanisms and environmental limits of life. NASA. Retrieved January 12, 2009. ↑ Stephen Hart, 2003. Cave Dwellers: ET Might Lurk in Dark Places. Space.com. Retrieved January 12, 2009. ↑ David Darling, Jupiter, life on. The Encyclopedia of Astrobiology, Astronomy, and Spaceflight. Retrieved January 12, 2009. Cohen, Jack and Ian Stewart. 2002. Evolving the Alien: The Science of Extraterrestrial Life. London, UK: Ebury Press. ISBN 0091879272. Dole, Stephen H. 1970. Habitable Planets for Man, 2nd ed. New York, NY: American Elsevier Publishing Co. ISBN 0444000925. Gonzalez, Guillermo and Jay W. Richards. 2004. The Privileged Planet. Washington, DC: Regnery. ISBN 0895260654. Grinspoon, David. 2004. Lonely Planets: The Natural Philosophy of Alien Life. New York, NY: ECCO. ISBN 9780060185404. Lovelock, James. 2000. Gaia: A New Look at Life on Earth. New York, NY: Oxford University Press. ISBN 0192862189. Schmidt, Stanley, and Robert Zubrin, eds. 1996. Islands in the Sky. New York, NY: Wiley. ISBN 0471135615. Ward, Peter, and Donald Brownlee. 2000. Rare Earth: Why Complex Life is Uncommon in the Universe. New York, NY: Copernicus. ISBN 0387987010. Martyn J. Fogg Terraforming Information Pages. This page was last modified on 29 March 2019, at 20:58.